Three layers of pavlova with fresh whipped cream and a trio of mixed berries in between. Make the Pavlova: Preheat the oven to 250 degrees F. Line a baking sheet with parchment paper and draw three 8-inch circles on the parchment paper (I traced 8-inch parchment rounds, but you could cake pans or anything else about the same diameter). Spray lightly with non-stick cooking spray. Using an electric mixer with the whisk attachment, beat the egg whites on medium speed until frothy, then add the cream of tartar. Increase the mixer speed to medium-high and beat to soft peaks. While continuing to beat the egg whites, gradually add the granulated sugar (I estimate that I added about 3 tablespoons at a time) and beat until glossy and stiff peaks form. Divide the meringue evenly between the three circles and use an offset spatula to form a circular shape. Bake for 30 to 45 minutes, or until firm to the touch. Turn off the oven and prop the oven door open with a wooden spoon. Allow the pavlova to cool completely in the oven. Make the Whipped Cream: Place the heavy cream, sugar, and vanilla extract in a large bowl and beat on medium-high speed until it holds soft peaks. 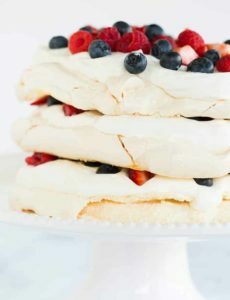 Assemble the Cake: Very gently lift one of the pavlova layers off of the parchment paper and place on a serving plate. Top with one-third of the whipped cream, and sprinkle with a mixture of raspberries, blueberries, and chopped strawberries (I didn't measure how much I used, feel free to use a little or a lot!). Gently place another pavlova layer on top of the fruit, spread another one-third of the whipped cream and sprinkle with fruit. Finally, top with the last pavlova layer, remaining whipped cream and more fruit. Serve immediately or refrigerate for up to 4 hours. Feel free to use whatever kind of fruit you like best!